Regarded as one of Finland's most prominent pianists and one of the most distinguished musicians in the world, Paavali Jumppanen has gained international critical and audience acclaim, with reviews such as “a rare wedding of intellectual penetration, coloristic imagination, and sheer virtuoso firepower” and “immense power and an extraordinary range of colors.” Cyprus audiences surely remember his breath-taking performance of Messian's Vingt Regards Sur l’Enfant Jėsus in 2008, and his exciting all-Beethoven recital in 2010, as part of the Pharos Arts Foundation's Concert & Recital Series. For his long-awaited return to Cyprus, on Wednesday 5 Oct! ober 2014, at The Shoe Factory, Nicosia / 8:30pm, Jumppanen will perform works by Debussy, Schumann and the Cyprus premiere of a work by Finnish composer Jaakko Kuusisto. 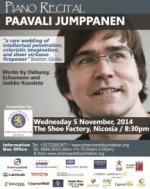 The recital is supported by the Embassy of Finland. Finnish pianist Paavali Jumppanen was born in 1974 in Espoo where at the age of five he began piano lessons at the Music Institute. In 1992 he entered the Sibelius Academy in Helsinki and from 1997 to 2000, he studied with Krystian Zimerman at the Basel Music Academy in Switzerland. In Basel, he also studied the organ, fortepiano, and clavichord. In addition to his institutional studies, Russian born pianist Konstantin Bogino has been an important mentor for Paavali Jumppanen throughout his studies and career. After winning first prize at Helsinki’s Maj Lind Competition in 1994, Paavali Jumppanen has become regular soloist of man! y of Finland’s leading orchestras. He frequently appears with the Helsinki and Turku Philharmonic orchestras, Finnish Radio Symphony Orchestra, and Lahti Symphony Orchestra. He has also performed extensively in Europe, Japan, and Australia, appearing with the Melbourne Symphony, Oslo Philharmonic, Stuttgart Philharmonic and the BBC Symphony Orchestra as well as appearances at numerous festivals including the Kuhmo Chamber Music Festival in Finland, the La Roque d’Anthéron Festival in France, the Chanel Nexus festival in Tokyo and the Messiaen Festival in France. In 2015 Paavali Jumppanen will begin serving as the artistic director to PianoEspoo festival, the most prominent international piano festival in his native Finland. His New York debut in 2001 at the 92nd Street Y, presented by Young Concert Artists, garnered reviews of “fresh and exciting” playing and “immense power and an extraordinary range of colors.” Jump! panen has since toured extensively in the US performing at the Kennedy Center in Washington, DC and at the Isabella Stewart Gardner Museum in Boston, where he appears frequently. His New York appearances have included performances at the Metropolitan Museum, Morgan Library and at Carnegie's Weill Recital Hall. In 2002, he made his New York concerto debut with the New York Chamber Symphony conducted by Gerard Schwarz at Alice Tully Hall. In the recent years, Paavali Jumppanen has dedicated much of his time into exploring music of the Viennese Classical Period. He has often performed the complete Beethoven Piano Sonatas cycle and following one of his Beethoven recitals the Boston Globe reported how “the sheer, overflowing energy of his musicianship held one’s attention throughout this impressive performance and the result was a bracing and enjoyable reminder of how path-breaking Beethoven’s music was.” Jumppanen has recently c! ompleted a multi-year project of recording the Sonatas cycle. First part of the recording was released in 2014 (Ondine). His recording of complete Sonatas for Piano & Violin by Beethoven (Claves) performed with violinist Corey Cerovsek received the Midem Prize of Cannes in February 2008 for best chamber music disc of the year.